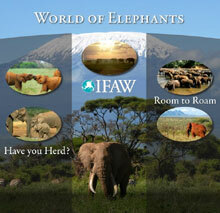 Elephants are the largest land animals on our planet, but size is just the beginning. This mighty species is also one of the world’s most intelligent, social and emotional animals. Yet its future is alarmingly fragile. 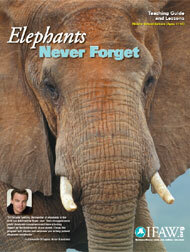 Elephants, Never Forget brings the world of elephants – from the African savannah to Asian rain forests – right into your classroom. The lessons and activities also encourage your students to examine and discuss the challenges that threaten the survival of one our most beloved species. There are also creative activities appropriate for younger students - and fun for older ones as well. Visit our Teacher's Library for a wealth of FREE online lesson plans on animal welfare and conservation themes. To join our mailing list and receive emails about new free IFAW educational resources and our quarterly newsletter World of Animals, register here today. The companion video is an excellent introduction to the content, concepts and issues presented in the education pack and is appropriate for general youth audiences. Based on the printed guide with bonus video, images, and text content, the World of Elephants Interactive poster is perfect for interactive white board lessons and extension activities.